Sleeps 6 in 3 bedrooms from £375 to £745 per week! Lovely 3 bedroom fully air-conditioned villa with free WiFi opposite the pool and gardens and within walking distance of the beach! Sleeps 4 in 2 bedrooms from £295 to £495 per week! Stylish 2 bedroom fully air-conditioned apartment, with large roof terrace, free WiFi and UK television. Sleeps 6 in 3 bedrooms from £495 to £1,095 per week! Stunning 3 bedroom fully air-conditioned villa with large private pool, gorgeous gardens and free WiFi and located within easy walking distance of bars, restaurants and supermarkets. Sleeps 6 in 3 bedrooms from £495 to £1,045 per week! Sleeps 6 in 3 bedrooms from £395 to £745 per week! 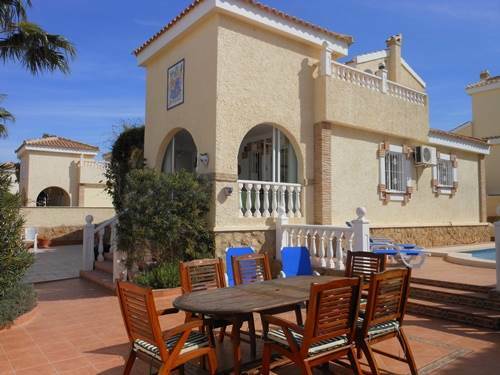 3 bedroom fully air-conditioned villa on 4 floors with sea views from the roof terrace, free WiFi and Satellite TV situated opposite the communal pools and gardens and within walking distance of the beach. Sleeps 6 in 3 bedrooms from £495 to £1,025 per week! Beautiful 3 bedroom fully air-conditioned villa with private pool and free WiFi, within easy walking distance of bars, restaurants and supermarkets. Sleeps 4 in 2 bedrooms from £265 to £425 per week! Lovely 2 bedroom, 2 bathroom fully air-conditioned apartment with large roof terrace, free WiFi, Satellite TV and sea views, within easy walking distance of bars, restaurants and the beautiful Carabassi beach. Sleeps 4 in 2 bedrooms from £360 to £725 per week! Luxury 2 bedroom fully air-conditioned apartment, with large roof terrace, infinity pool, free WiFi and sea views. Sleeps 6 in 3 bedrooms from £495 to £995 per week! Sleeps 4 in 2 bedrooms from £275 to £445 per week! Lovely first floor part air-conditioned apartment with free WiFi, large roof terrace within easy walking distance of the beach. 3 bed fully air-conditioned holiday villa with private pool, off road parking, free WiFi, Satellite TV and great views and within easy walking distance of bars, shops and restaurants. Sleeps 10 in 5 bedrooms from £945 to £1,795 per week! Spacious 5 bedroom, 4 bathroom detached villa with large private pool, air-conditioning in all rooms and free WiFi throughout the villa. Sleeps 4 in 2 bedrooms from £295 to £525 per week! Very stylish 2 bedroom part air-conditioned apartment, with large roof terrace, free WiFi, Satellite television and overlooking pool and gardens. Sleeps 4 in 2 bedrooms from £495 to £995 per week! Beautiful and stylish 2 bedroom, 3 bathroom fully airconditioned villa with private pool, free WiFi and a host of extras! Sleeps 6 in 3 bedrooms from £325 to £595 per week! 3 bed part air-conditioned apartment with frontline views of the Med and free WiFi! Sleeps 4 in 2 bedrooms from £275 to £425 per week! 2 bedroom holiday villa in Gran Alacant, Alicante with free WiFi, roof terrace, Satellite TV and within easy walking distance to bars, restaurants, supermarket and pool area. Sleeps 4 in 2 bedrooms from £245 to £425 per week! 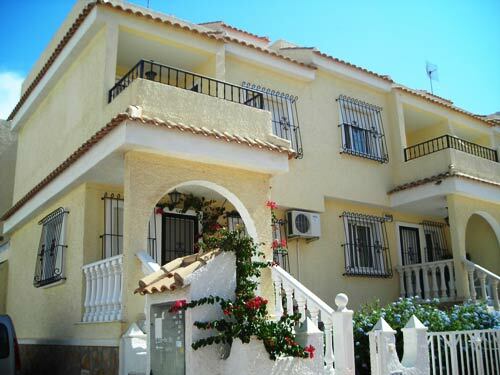 Spacious and sunny 2 bed fully air-conditioned villa (with 3 sun terraces) and within walking distance to the beach! Super first floor, fully air-conditioned corner apartment overlooking the swimming pool on a gated community, with free WiFi and within easy walking distance of the beach. Sleeps 4 in 2 bedrooms from £250 to £425 per week! First floor 2 bedroom apartment overlooking pool and gardens with air-conditioning and free WiFi. A stunning and beautifully furnished, 3 bedroom fully air-conditioned detached villa with large garden and private pool. Sleeps 6 in 3 bedrooms from £475 to £1,025 per week! Superb 3 bedroom fully air-conditioned villa with a large 8m x 5m private pool, Satellite TV and free WiFi throughout the villa. Sleeps 4 in 2 bedrooms from £425 to £995 per week! 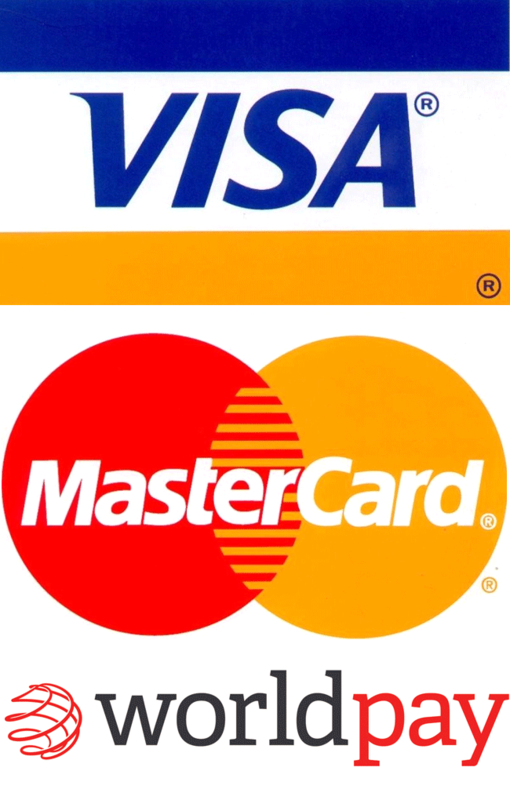 Fantastic modern 2 bedroom, 3 bathroom fully air-conditioned villa with private pool and free WiFi. Beautiful 3 bedroom fully air-conditioned villa with private pool, gorgeous garden and free WiFi situated in a quiet road, but near to all amenities. Sleeps 12 in 6 bedrooms from £1,100 to £2,250 per week! Absolutely stunning and superbly furnished 6 bedroom, 5 bathroom part air-conditioned detached villa with private pool, built in jacuzzi and free WiFi on a 400m2 plot. Spacious 3 bedroom, 3 bathroom detached villa with large private pool, air-conditioning in all rooms and free WiFi throughout the villa. Sleeps 4 in 2 bedrooms from £280 to £570 per week! Stunning fully air-conditioned 2 bedroom villa in a gated community with beautiful gardens, a choice of 2 swimming pools, free WiFi and near the beach! Lovely 3 bedroom, 3 bathroom fully air-conditioned villa with its own private pool, fantastic views and free WiFi! Sleeps 4 in 2 bedrooms from £295 to £450 per week! Charming 2 bedroom fully air-conditioned villa, opposite communal pool with free WiFi and UK television. Sleeps 6 in 3 bedrooms from £375 to £635 per week! 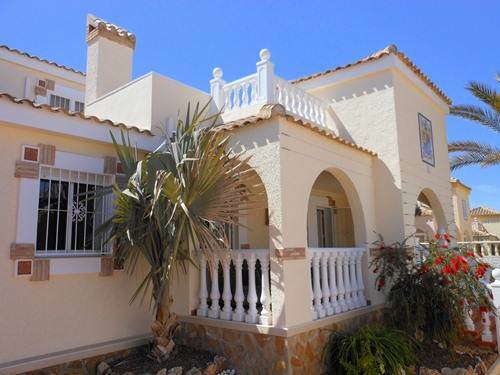 Stunning 3 bedroom, 3 bathroom fully air-conditioned villa in Camarcha Playa in Gran Alacant. One of only 6 houses sharing the pool, and with fantastic beach and sea views from the lounge and kitchen as well as two of the bedrooms, plus free WiFi! Sleeps 4 in 2 bedrooms from £235 to £415 per week! Lovely 2 bedroom fully air-conditioned apartment with spacious roof terrace, free wifi and next door to the pool, plus within easy walking distance of the Gran Alacant Commercial Centre. Lovely 2 bedroom fully air-conditioned villa with free Wi-Fi and large private sun terrace in Gran Alacant close to beach, bars and restaurants. Sleeps 6 in 3 bedrooms from £295 to £525 per week! 3 bedroom, 2 bathroom fully air-conditioned villa centrally located and within easy walking distance of supermarket, cafes, bars restaurants and street market. Sleeps 4 in 3 bedrooms from £240 to £425 per week! Nicely furnished 3 bed, part air-conditioned first floor apartment with WiFi and overlooking the swimming pool and gardens. Thoroughly modern 2 bedroom apartment on Altomar 2 in Gran Alacant with air conditioning, free WiFi and UK TV plus large roof terrace. Sleeps 8 in 4 bedrooms from £295 to £695 per week! 4 bedroom, 3 bathroom fully air-conditioned villa with free WiFi well located with easy access to supermarket, cafes, bars and restaurants. Super fully air-conditioned 2 bedroom villa overlooking the swimming pool on a gated community, with free WiFi and within easy walking distance of bars and restaurants. Sleeps 6 in 3 bedrooms from £300 to £595 per week! 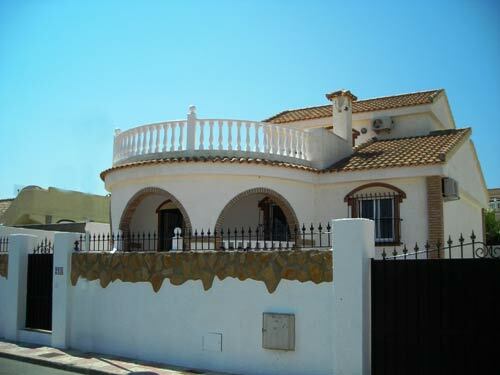 Superb 3 bedroom, 3 bathroom part air-conditioned detached villa with free WiFi on 3 floors with sea views and communal pool. 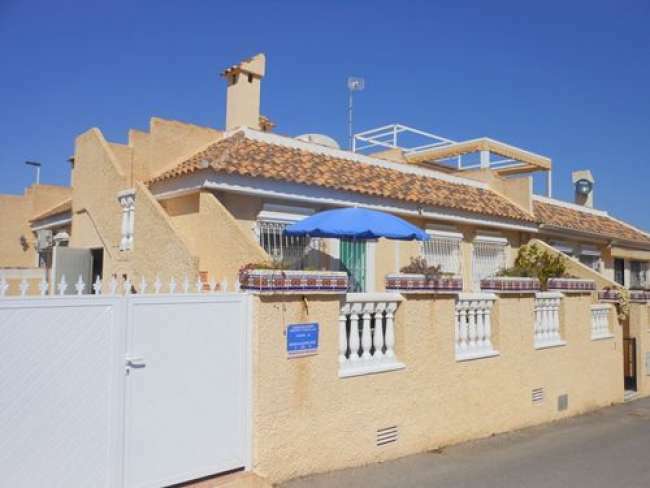 Situated on the prestigious and gated Brisas Del Faro urbanisation. Very nicely furnished 3 bedroom, 3 bathroom fully air-conditioned villa with private pool and free WiFi. Sleeps 6 in 3 bedrooms from £495 to £1,150 per week! Super and recently refurbished 3 bedroom, 2 bathroom villa with A/C, free WiFi, private pool, mature gardens and large outside space. Very nicely furnished 3 bedroom, 3 bathroom fully air-conditioned villa with private pool, off road parking and free WiFi. 3 bedroom, 3 bathroom fully air-conditioned villa with large private pool in mature gardens located within easy walking distance of bars, restaurants and supermarkets. Sleeps 4 in 2 bedrooms from £350 to £825 per week! Superb 2 bedroom ground floor apartment with air-conditioning, private swimming pool in secluded garden just minutes from amenities! Sleeps 4 in 2 bedrooms from £295 to £465 per week! Super 2 bed, 3 bath fully air-conditioned holiday villa to rent in Gran Alacant with large garden, communal pool, stunning views, Satellite TV and WiFi and within easy walking distance of the Gran Alacant Commercial Centre. Lovely 3 bedroom fully air-conditioned villa with private pool and free WiFi plus off road parking! Sleeps 6 in 3 bedrooms from £375 to £725 per week! 3 bedroom, 3 bathroom fully air-conditioned villa with free WiFi and within walking distance of beach, cafes, bars and restaurants. 3 bedroom, 3 bathroom fully air-conditioned villa with private pool and free Wi Fi. Walking distance to amenities and a short drive to the superb beach. Sleeps 4 in 2 bedrooms from £225 to £425 per week! 2 bedroom part air-conditioned first floor apartment with a spacious roof terrace and within easy walking distance to the beautiful sand-duned beach. Sleeps 4 in 2 bedrooms from £425 to £925 per week! Beautiful, superbly furnished 3 bedroom, 3 bathroom fully air-conditioned detached villa with private pool, built in jacuzzi and free WiFi on a 400m2 plot. 3 bedroom, 3 bathroom fully air-conditioned villa with private pool and free WiFi!